Offensive Tatoo, Cool Or Stupid? You are here: Home / Media and Entertainment / Offensive Tatoo, Cool Or Stupid? 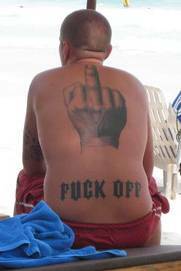 Why on earth would some get such a tatoo on their back? Great print? Cool? Impressive? Stupid?